There are a huge amount of computations when 3D animation designers make pictures and clips to be animation. QM (Queue Manager) automatically distributes processes to many processors/computers. If it needs to take 15 days to finish the computations/processes with one computer, we could distribute the work to 15 computers, so when they work together, only needs one day to finish it. Because we just need to use these computers for computing, if using HDD computers, it will be a waste of money and computer resources. And if other people work on these computers, it will affect the computations. Moreover, sometimes, it will be failed with HDD computers, such as viruses and trojans attacks etc. 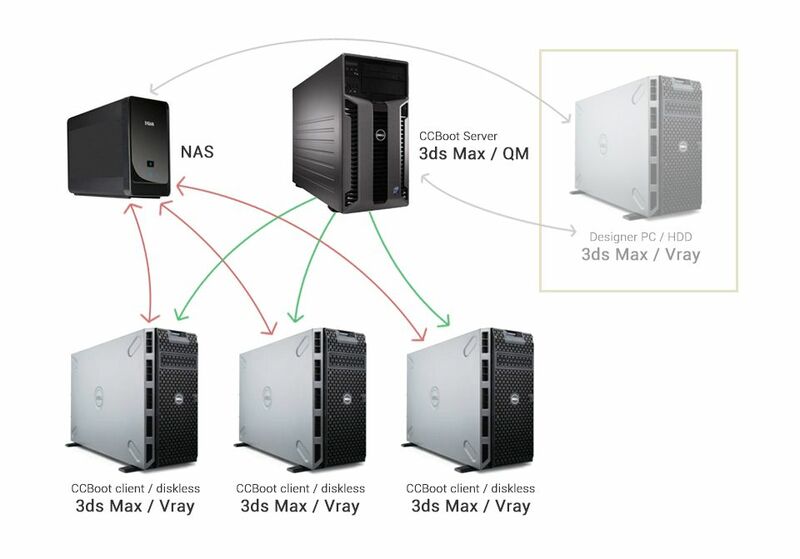 Therefore, CCBoot diskless boot solution comes to 3D animation field in the right time. 1. Install CCBoot server, 3DS Max and QM on the server. 2. Install CCBoot client, 3DS Max and Vray (the plugin of Distributed Rendering) on the client PCs. After clients diskless boot, the Vray will auto monitor and receive the render tasks. 3. NAS stores video resources and products of the Designer PC and client PCs. 4. Designer makes animation on the Designer PC with HDD, 3DS Max and Vray installed on it. After finished the animation, the Designer PC will submit it to the QM, and QM will auto search Vray, then distribute the render tasks to client PCs which have been installed the Vray. 5. Client PCs do the render tasks, after finished, the product will be saved to the NAS. Note: Every software can work with CCBoot like this, as long as it can do net render and/or distributed render with CPU power (not GPU) rendering.